Skip the takeout and make your Pad Thai at home instead! This easy to make chicken and shrimp Pad Thai will be on the table in 30 minutes! Fast, easy, delicious. I had never actually eaten Pad Thai until about a year ago. That’s kind of crazy, right? Isn’t it a super popular takeout option? I feel like it is. Clearly #3 is true because I’ve been missing out on this deliciousness that is Pad Thai for far, far too long. After finding this recipe (and promptly eliminating the tofu from it) I started making up for lost time. My kids were definitely really sick of Pad Thai by the time I stopped making it incessantly. I’m not sick of it yet though, but it’s now been a while since I last made it. After looking at these photos again, I think it’s going to be on the menu for next week. 30 minutes, better then takeout, amazing Pad Thai. If you haven’t tried it yet – make this. It’s so good, you’ll join me in wondering why on earth it’s taken you so long to try. Plus, it’s 30 Minute Thursday again! If you’re new around here, 30 Minute Thursday is the first Thursday of every month, where myself and some of my blogging friends share recipes that you can make in 30 minutes or less, to get you through those busy nights! So scroll down to below the recipe for more tasty 30 minute meals from my friends. You can also check out past 30 Minute Thursday posts here. 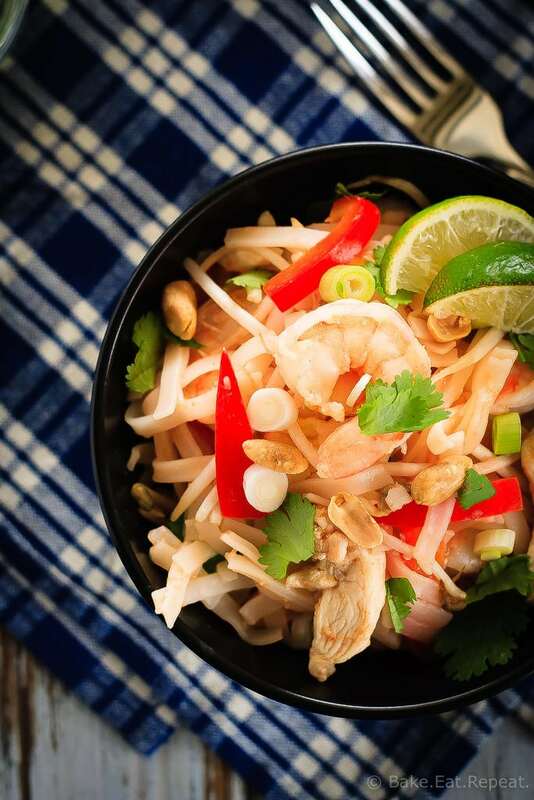 Skip the takeout and make your Pad Thai at home instead! 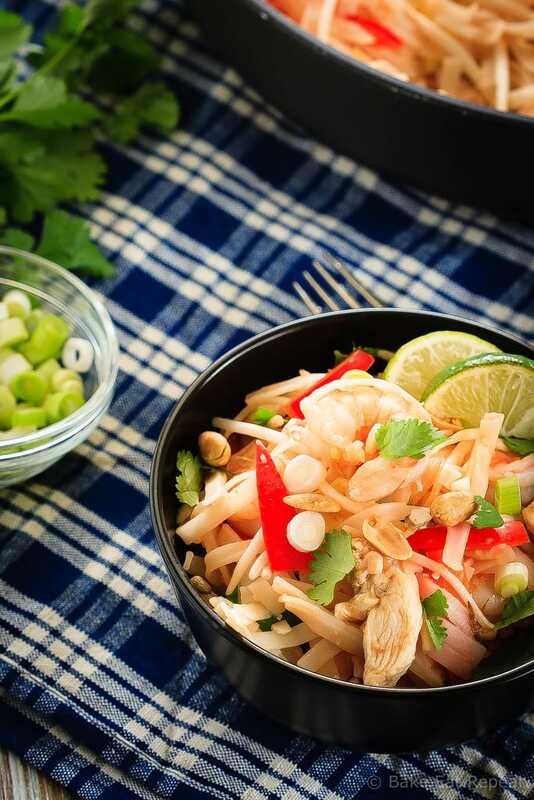 This easy to make chicken and shrimp Pad Thai will be on the table in 30 minutes! In a large pot of boiling water, cook the rice noodles until softened, according to the package directions (the ones I buy take 6-8 minutes). Drain and set aside. Meanwhile, in a small bowl, whisk together the ketchup, chicken broth, fish sauce, lime juice, sugar and sriracha sauce until well combined. Set aside. In a large non-stick skillet, cook the eggs over medium heat, and then remove the scrambled eggs to a plate. Add the shrimp and chicken to the skillet, and stir-fry until it is no longer pink, about 3-4 minutes. Add the onion, garlic, red pepper and ginger to the pan and stir-fry for another 2 minutes until they start to soften. Add the prepared sauce and the cooked noodles to the pan and cook, stirring to coat everything with the sauce for 2-3 minutes. Return the scrambled eggs to the pan, along with the bean sprouts, and stir to combine and heat through. 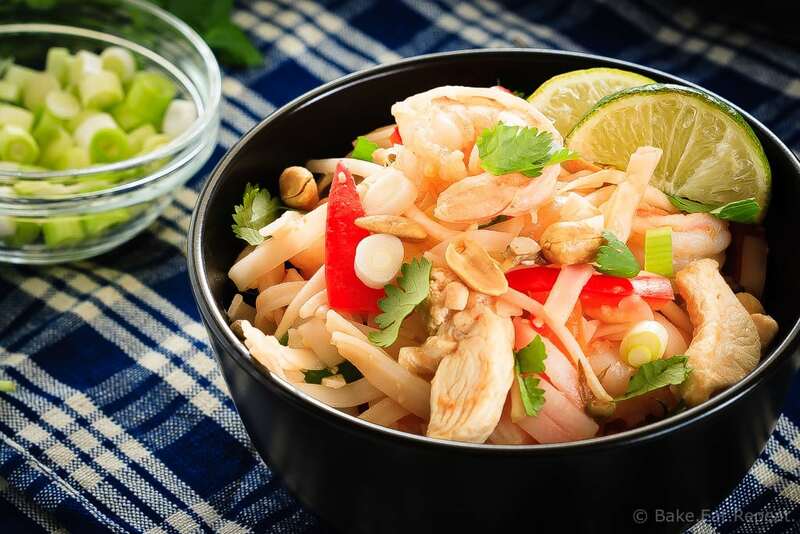 Serve the Pad Thai with green onions, peanuts, cilantro and lime wedges. Clearly we are on the same page currently, because I just posted a similar recipe because I was CRAVING peanut sauce like WHOA. I can't get enough of these kinds of meals :) LOVE the video too! It looks delicious. I'm not sure what you mean but rice stick noodles where can they be purchased? What brand did you use in this dish? Hi Janis, I buy the "Erawan" brand that they have at Superstore, it's just in the ethnic aisle of the store. The package is labelled "rice stick" and they're just a 1/4 inch wide, transparent rice noodle. Any kind of rice noodle should work just fine though, just get the kind that are thick and flat rather then the really thin ones like vermicelli. I think the ethnic section of your grocery store would be your best bet to find them. Hope you like it! I hear you on the tofu thing...I just can get on board with that no matter how hard I try! I do love pad thai and this looks so delicious! I have no idea why I haven't made it at home yet and this is the best place to start! Oh I love pad thai (and tofu - lol!). I can't believe you just recently started eating it. Sounds like you have a lot of years of making up to do. Ha! This recipe sounds great. Love a good take-out, fake-out! What a gorgeous dish, Stacey! I do love pad thai, though I've never made it myself. I'm not the biggest fan of tofu either, it's one of those foods that I can live without, but I'll eat it if I have to! :) Love your variation and that this is ready in just 30 minutes!